Romanian auteur Radu Jude's latest sees him partner with novelist Florin Lazarescu for a first period piece, a tale of bigotry, duty and revenge set in 19th century Wallachia, then under Ottoman rule. Growing up under Communism when all that was taught in schools placed an exclusive emphasis on the heroic aspects of the region's history, Jude and Lazarescu set out to present a truer picture, trawling documentary evidence to find a story that might convey some of the murkier aspects of their homeland's heritage. Aferim! went on to win Jude the Silver Bear for Best Director at last year's Berlin International Film Festival. It's hard to dispute the jury's verdict, the director delivering a splendidly earthy vision of life as lived during a little-represented moment of Central Europe's turbulent past. 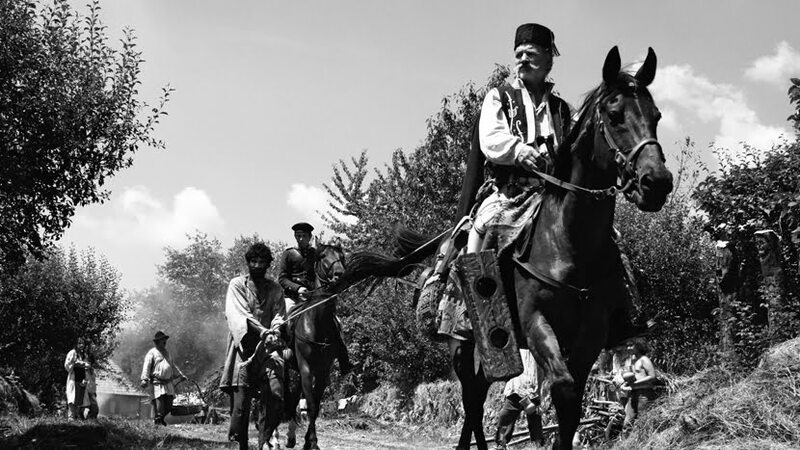 Shot in black-and-white 'Scope, Jude's film tells of a police constable and his son riding the hills and valleys of the Carpathians on the trail of a fugitive Roma serf accused of stealing from his master. Eventually capturing Carfin (Toma Cuzin), Constandin (Teodor Corban) and Ionita (Mihai Comanoiu) begin the journey home but come to sympathise with their prisoner en route, doubting the justice of returning him to the clutches of despotic boyar Iordache (Alexandru Dabija) once they know the real reason he's being hunted and the probable fate that awaits him. The film's title is a loan word borrowed from Turkish, effectively meaning "bravo" but intended sarcastically, its use implying disapproval of the actions of all who appear here. By modern standards, Jude has unearthed much to decry, from the racist attitudes espoused by almost everyone (and one especially toxic priest in particular) to the violence meted out to Carfin and his fellow Gypsies: the men beaten, the women pressed into prostitution. These impoverished people are treated like a sub-species throughout, a problem, Jude and Lazarescu imply, that persists today. One of the disparaging terms used to describe them in Aferim! means "pharaohs", aligning the Roma with the Ancient Egyptians because of their dark complexions and providing a precedent for enslaving them. An unflinching depiction of ingrained hatreds in a weary world where suffering is a fact of existence, there is, paradoxically, much to savour and enjoy. Constandin's hearty joie de vivre and fondness for folksy aphorisms and low humour make for vivacious company, while the grandeur of the landscape consistently impresses. A scene in which the lawmen attend a rural fete teems with insightful details, notably an early version of a Ferris wheel in motion. The film borrows its structure from those great American psychological Westerns that similarly dealt with bounty hunters, pictures like Anthony Mann's The Naked Spur (1953) or Budd Boetticher's Ride Lonesome (1959). Its story of two guards bonding with their charge meanwhile echoes Hal Ashby's The Last Detail (1973). We share Ionita's fears for Carfin and are moved by Constandin's attempts to intervene on his behalf but know there is little chance of forgiveness for this man in so brutal a time. Carfin's inevitable eventual punishment at the hands of the boyar is as wince-inducing and vicious an act of cruelty as you'll see this side of Bone Tomahawk (2015).